Birthday boy Matt Green celebrates his equaliser for Stags this afternoon. Picture by Steve Uttley. Mansfield Town’s poor home results this season continued today as they succumbed to a 3-2 defeat against an excellent Accrington Stanley side on a dark, dismal and drizzly afternoon at One Call Stadium. Accrington dominated the first half hour after going ahead on three minutes and would have sewn the game up but for some great saves from Brian Jensen. Against the run of play, Matt Green, celebrating his 29th birthday, levelled the scores on 27 minutes. But the Stags failed to net again in their best spell of the game before the break. After the interval there were few clear chances until Accrington struck again through ex-Stag Billy Kee on 72 minutes, with his 10th of the season, and sub Terry Gornell on 84 minutes wrapped the game up. There was late hope as Chris Clements bagged a splendid 25 yard free kick on 88 minutes. But in truth Mansfield didn’t deserve a point on the day against one of the best sides seen at OCS all season so far. Stags brought both Nathan and Jack Thomas into the starting line-up for their first game of 2016. Nathan Thomas replaced Matty Blair on the wing while Jack Thomas took over Craig Westcarr’s role just behind striker Matt Green. Although suffering with a slight groin strain, Adi Yussuf was named on the bench for a possible late cameo if needed. Accrington’s defeat at Northampton last time out was their first in eight games. Mansfield again made a slow start at home and fell behind in the third minute due to more poor defending. Windass was all too easily able to get down the left to the by-line to cross and Mingoia was first to the ball to turn home from six yards. Soon after Chaoman’s short pass to Pearce was intercepted and Mingoia was again in on goal, only for Adams to produce a superb saving tackle. Stanley came again and Windass slotted a great pass into the path of Kee in the box, Pearce’s challenge doing just enough to make Kee slot his low finish the wrong side of the post. The home side rallied and started to have some possession, but the visitors’ defence was firm and they looked very quick on the counter, Windass showing good acceleration to get into the box and force Jensen to get down to save at his near post. Soon after McConville easily ghosted past Rose on the left and got away a low finish that Jensen turned aisde with his legs. Kee sparked an angry confrontation on 24 minutes as he slid in late on Jensen on the wet surface as the keeper gathered a through ball and caught him full on. Jensen needed treatment as players gathered angrily around Kee and the referee eventually showed him a yellow card. Accrington should have been 2-0 up on 26 minutes. Kee held the ball up under pressure from Collins to set up McConville, who walked through a static defence only to see Jensen make a brilliant block from six yards. A minute later and against the run of play, Stags scored with their first shot on target. 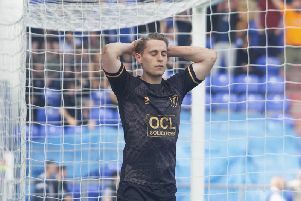 Defender Davies failed to cut out a through ball and Green was away, racing into the box on the left and netting off the inside of the far post with a deadly left-footed finish. Stags were suddenly awake and Mooney did well to cut out Green’s ball across the box to an unmarked Lambe, then Clements warmed his hands from 20 yards. On 37 minutes Stags broke well down the right and Green held off Wright and made space for a venomous shot that wasn’t far over the bar. On 45 minutes Rose slid in to win the ball cleanly as McConville tried to break, so home players and fans alike were furious when the Stanley player stayed down and the referee decided to book Rose. Halliday’s aggressive run in stoppage time ended with him pulling a finish well wide. When Green was caught late after sending the ball forward and no action was taken the home fans booed the referee loudly and Adam Murray was straight over to have words at the end of a half in which Stags were fortunate to still be in the game. Straight after the restart Green got down the left and pulled a low pass back from Lambe, whose sidefooted finish was on target but without power. Jack Thomas then gave the ball away with a loose pass and, in sliding in to win it back, hacked Mingoia down to earn a caution. Nathan Thomas had made little impact on the game and was replaced by Matty Blair on 53 minutes. Within two minutes his low cross was backheeled by Green and pushed away by Mooney and, with the keeper out of his goal, Jack Thomas was well over with his shy at the net from 20 yards. On 64 minutes Mansfield made a change up front as Westcarr took over from Green. There had been little goalmouth incident all half, but Accrington grabbed the lead out of the blue on 72 minutes. A break down the right saw an Accrington shot blocked but the ball dropped fortunately and invitingly for Kee 14 yards from goal where he volleyed a superb finish beyond Jensen. It was all over with six minutes to go as Buxton crossed from the left to the far post. Gornell’s first effort was turned onto the post by Jensen, but he was helpless as Gornell smashed home the follow-up high into the net. The game looked over, but two minutes from time, Stags pulled one back with a perfect free from Clements. Stepping up 25 yards from goal in a central position, he picked out the top right corner, giving Mooney no chance. In the five added minutes Jensen again did superbly well to thwart Gornell in a one-on-one. But there was no way back for Stags with home fans letting their feelings be known at the final whistle. STAGS: Jensen, Rose, Pearce, Collins, Adams, Lambe (Yussuf 76), Clements, Chapman, Nathan Thomas (Blair 53), Jack Thomas, Green (Westcarr 64). Subs not used: Shearer, Beardsley, Tafazolli, McGuire. ACCRINGTON: Mooney, Pearson, Davies, Mingoia (Gornell 71), Windass (McCarton 67), McConville (Buxton 76), Crooks, Wright, Conneely, Kee, Halliday. Subs not used: Etheridge, Barry, Proctor, Wakefield. REFEREE: Scott Duncan of Northumberland. CHAD STAGS MAN OF THE MATCH: Brian Jensen.